Before going to sleep, I always wash my face whether I have been exposed under the sun or when I'm just at home. It feels good to have a clean face before sleeping. You don't just feel clean, but you will feel fresh and refreshed after a long day. 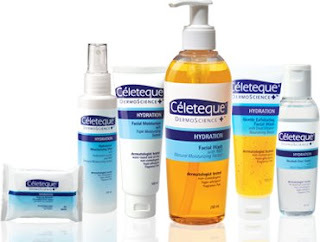 The Celeteque Dermoscience Hydration Facial Wash is a must buy. The small one only cost P79 at Watson's if I'm not mistaken. Such a great bargain for having a softer skin. I've read in one article of a famous celebrity that in order to maintain a healthy skin despite of heavy makeups is to use a moisturizer. For me, I use it during the day before I leave then use it again at night after the facial wash before I sleep. That's the last thing I apply on my face. It doesn't dry your skin nor cause uneven skin. The Celeteque Dermoscience Hydration Moisturizer is one beauty magic that every woman should have. I think, it costs P130+. With Celeteque Dermoscience Hydration, no woman will feel a dry skin anymore.